We all love our Spyders and we love the company that made it all happen. This shirt shows the relationship between Canada (Can) and America (Am) in the form of the two countries flags. We love our Can Am Spyders and they love us! I ordered the Can-Am flag tee shirt and absolutely love it!! It will be great to wear for riding and showing support to Lamonster Garage and Can-Am. Now, if Mother Nature would cooperate and let me ride. As always, great customer service from Lamonster Garage. Love this shirt. It fits great and I l like to ride in long sleeves due to medication my skin and sun is not a good mix. Nice shirt must wear this weekend. I love this shirt! It looks really cool with the Lamonster on the sleeves, would love to see it in other colors. Love the shirt. Would have preferred to have it available in grey as white shows all my ketchup stains. It’s very nice to have a white, long sleeve shirt for riding, and especially one that says Spyder. Glad to promote LaMonster too! The shirt has very good quality materials used, fits as expected. 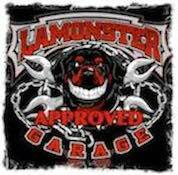 Customer service from this Lamonster Garage is still, and has always been, exceptional - Quick -accurate! !